We eat a lot of garlic, it lends a pretty vibrant flavor to even the simplest savory dishes and the health benefits of garlic are well documented. But how do you eat a harvest-full of garlic before it goes bad? We usually grow many cloves of garlic in our garden – I understand they repel aphids and beetles in the garden and make great companion plants for tomatoes and peppers so I usually plant them close by those crops when I can. When I harvest my garlic, I strip off the extra outside leaves to both clean off any clinging dirt as well as allow quicker drying of the clove. Then when the garlic is pretty dry I use the cotton string from a cattle feed bag and tie the garlic in layers. I hang the whole thing on this handy-dandy hanger I found at a local antique shop. But even through I’m using garlic pretty consistently I can never use it all fresh and I’d like to have some to use in the winter months as well. 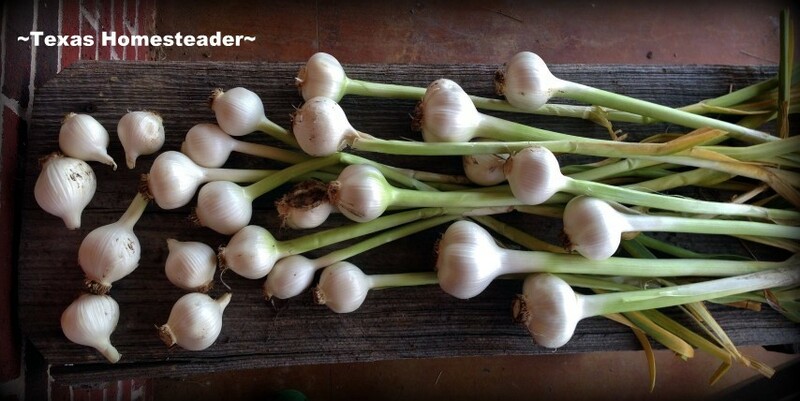 I preserve the extra garlic by separating the bulb and then stripping the cloves themselves, as if ready to use. Then I place all these cloves into a repurposed spice container that I keep in the door of my freezer. The cloves don’t stick together so when I want to use a clove of garlic I simply bring out my container, pull out a single clove and mince with a knife (garlic doesn’t freeze rock hard) or run it through my garlic press. We’ve noticed no difference in taste and since garlic is typically cooked in some way obviously there would be no difference in texture either. Add to that benefit that I’ve repurposed a container and also side-stepped buying something at the store that I can easily grow myself, which of course is important to me from an environmental standpoint. It’s good for my budget as well since I strive to provide as much for myself as I can before resorting to purchasing a product. 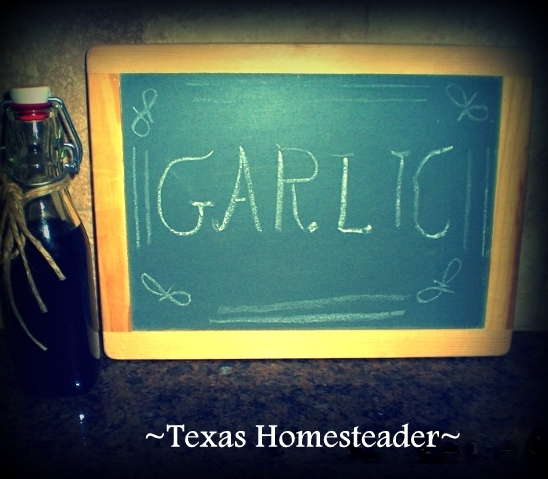 Have you ever tried to preserve your abundance of garlic from the garden? What worked best for you? 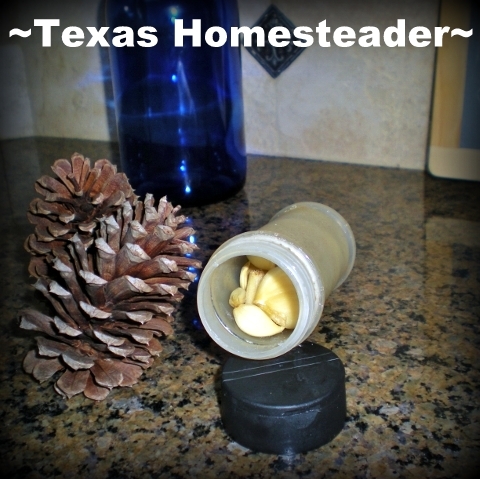 This entry was posted in Blog Posts and tagged Cooking, Food Preservation, Frugality, Gardening on July 23, 2013 by Texas Homesteader. I grow hard neck garlic. I store all the garlic I grow in my basement. My basement is climate controlled most of the year. In the winter we heat our house with wood and our basement is not heated. It can get down to about 50 degrees down there. My garlic stays nice and tight all year until I am ready to harvest the previous year. I absolutely LOVE garlic. In and on everything! I wanted to plant it this year but didn’t get to. Next year…its’ game on and hopefully I will have enough! I love it so much that–when company is coming over–instead of using air freshener or candles…I simply toss a bulb of garlic in the oven for a few minutes. Smells so inviting and then is ready to use on bread!! Thanks for sharing at the Friday Follow Along–and for making me hungry! I love garlic any way I can get it! I am also growing some this year next to my tomatoes and peppers, and I will be harvesting them soon. I didn’t know you could freeze the cloves whole, so I am going to try this. Thanks for the tip! I haven’t got to our garlic yet. I plan to pickle a lot this year. your garlic heads look wonderful! Thank you for sharing at TTF. I mince my garlic in a food processor and then add to a small jar. Add a thin layer of olive oil; screw on the lid and refrigerate. A 1/2 tsp. equals 1 garlic clove. So convenient when you need some minced garlic for a recipe. Top off with more oil as needed. freezing is a good idea, I did’t know you could do that. I haven’t managed to grow much garlic myself, but we bought some when it was cheap last season and chopped half of it into pieces, dehydrated it, and made garlic granules. We’ve run out of the half that we left fresh and using the granules now, its actually quite convenient, although I have to remind husband to only use a little, as its very strong! I wrote about this on my blog if you want the details. My hard necked garlic was fine well in to January when I used the last of it. 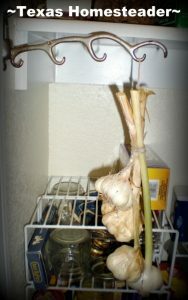 My soft necked garlic was braided and hung in the kitchen until April when I sliced and dehydrated the remaining cloves. I store the dehydrated garlic in a sealed jar to grind into powder as needed. This dehydrated state will last years.